Home » News » Which party has the best record on house-building? Which party has the best record on house-building? A lot of guff is heard about what party is best for house-building. It is an area, it should be said, that Labour think they have a lock on, and most surveys show the public rate them higher on housing than they do on other issues (but still not especially highly!). In response to the Government’s excellent Housing White Paper today, the SNP crowed about how the Conservatives had failed and Scotland was delivering. But she didn’t present any numbers, so is that just a Trump-style alternative fact? House-building is really dependent on the macroeconomic environment, so comparing the number of homes built now to 2006 or 2007 is pretty dumb. 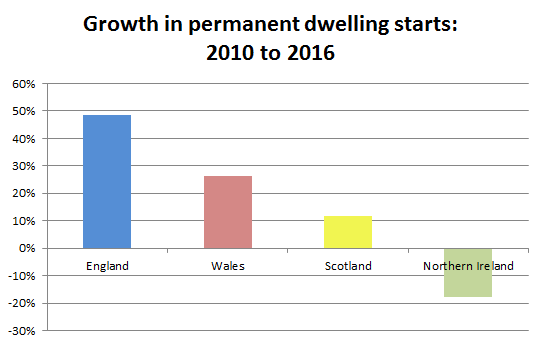 Should the UK be on the sort of house-building-boosting monetary steroids they were in the lead-up to the economic crash? Only if you want another crash! I’ve compared the record of Conservative-run and Labour-run boroughs before, and pointed out Camden’s failures. Pretty conclusive: based on the track record of the last six years, the Conservatives are the best party for house-building.